You want to be free, really free? Then here are 5 things you need to get rid of so you can begin to stand in the fullness that is you. Let go of resentment and anger – These emotions result from unmet expectations – What did you think was yours to expect and now, as you did not get it, you feel full of anger and resentment against someone who ultimately did the best they knew to do.It may be a parent (and this is so relevant to me as I work through my own mummy issues J ) or it may be a ex-partner. It may even be the government and the leaders of the country. You may be resentful of the nameless, faceless ‘rich’ people. Let go of fear – What would it mean to be fearless in all that you do? What would it mean to never allow fear to get in the way of all the things you know you want to be, do and have?What could life look like if you never made a choice based on fear? Let go of judgment – It is so easy to look around and pass judgment on people unlike you. The question to ask yourself is who made you judge and jury? Usually, people stand in judgment when others are a mirror image of the hateful parts of themselves.So, whenever you rise up in judgment against someone, it may be wise first and foremost, to take the log of wood out of your own eyes before you try to take the twig out of another’s eye. Let go of entitlement – You are not a victim but you make yourself a victim when you feel entitled to something that you have not earned.In business, people get caught up in blaming the social media platforms when things do not work for them. This is classic entitlement thinking – When you want everything for nothing. Someone else sheds blood and tears to provide a platform for you to do business and you feel all entitled to have it work the way you want it to…Get off your bum and build your own platform if you do not like it! Let go of guilt – This is a biggie for me and possibly for a whole lot of Mums out there. When you have a big passion that seems to take you away from the classic representations of mothering, you feel guilty all the time & you hold yourself back.Of course, there are different kinds of guilt and sometimes people do not even realize that the thing holding them back is their own feeling of guilt. They think they cannot go for what they want because it will leave some people behind, people they feel misplaced loyalty towards. This misplaced emotion then holds you back form living full out in pursuit of your God given purpose. For the sake of freedom, lets live instead in authority over our own thinking and emotions. Be free to forgive, this is a super power that breaks internal chains that bind you to the person or the entity you feel resentful or angry about. 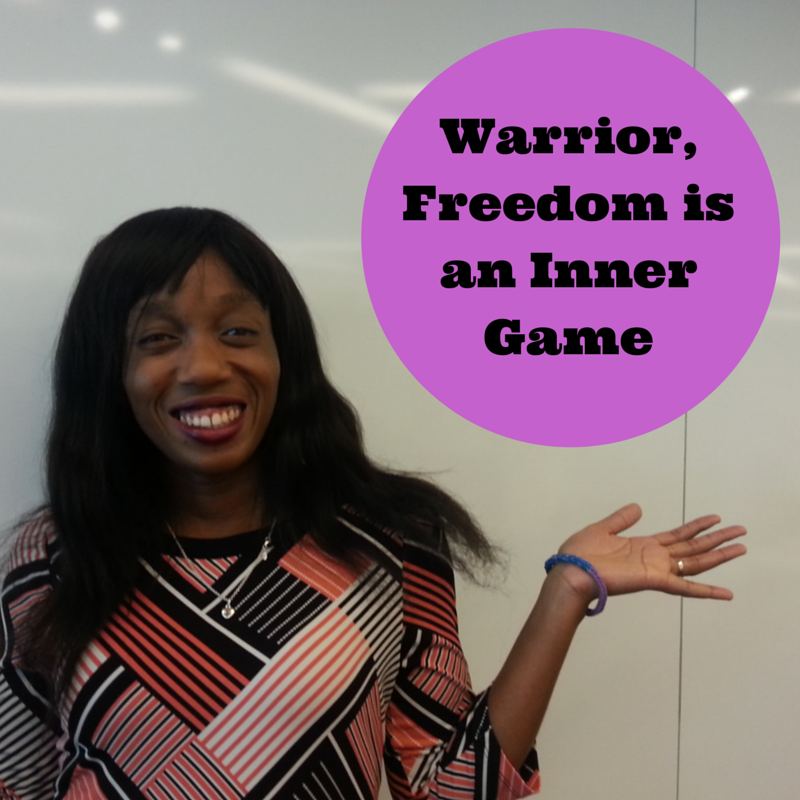 Remember, you have the power to be a wealthy warrior anytime you choose to be. Step up in love, in joy, in peace – These emotions, these feeling bring about incredible freedom inside and out. No longer need you be attached to outer circumstances in order to create your inner world. You are a warrior and you do battle first with yourself and then you move into the world and you create the life you want starting now.